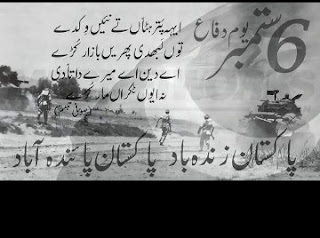 PAKISTAN Defense Day 6th September. 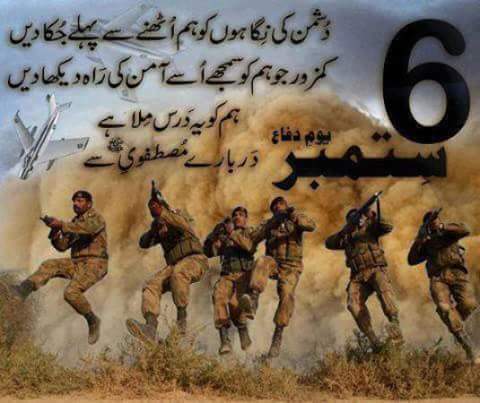 6th September #Defence Day is one of the most important events of Pakistan’s history. On September 6, 1965, Indian army crossed the international borders of Pakistan without a formal declaration of War. It was a time when not just our brave soldiers but the whole nation was cast into the mould of a cohesive unit to defend our home land and defeated the Indian Army and made them retrieve on all fronts. The long-standing border disputes, communal tensions, and conflict over the question of Kashmir flared up in a full-scale war between India and Pakistan in September 1965. Skirmishes at the Ran of Kutch flared up almost accidentally in the Spring of 1965, and India and Pakistan found themselves drawn into the first of their two undeclared wars. The dispute goes back to the days of the British rule in India. The Ran was the bone of contention between the princely state Kutch, and the British Indian province of Sindh. When British India was partitioned, Kutch acceded to India and Sindh to Pakistan. The issue was inherited by these two states along some 3,500 sq. miles of territory. From January 1965 onwards, border incidents became frequent. By all accounts the Indian forces were badly defeated in the Kutch area by the Pakistan army. At the Commonwealth Conference in Britain, the British Prime Minister Harold Wilson successfully persuaded both India and Pakistan to sign an agreement on June 30 to resolve the dispute. Failing to do so bilaterally, a tribunal was set up to resolve this dispute. This tribunal announced its verdict on February 19, 1965. It gave 350 sq. miles in the northern part to Pakistan and the rest of the Ran area to India. Events in Kashmir were also moving towards a climax. The Indian Prime Minister Lal Bahadur Shasta added more fuel to the fire by taking steps to absorb Kashmir further into the political body of India and stated that the Kashmir problem occupied a secondary place in successful relations between India and Pakistan. The application of articles 356 and 357 of the Indian Constitution to the Kashmir State which enabled the President of India to establish Presidential Rule in Kashmir and legislate, there was an effort to amalgamate Kashmir completely into the Indian Union. The Sardar-i-Riyasat would henceforth be known as Governor and would be appointed by the President of India instead of being elected by the local assembly. The Prime Minister would be styled as a Chief Minister, as in the states of the Indian Union. The Kashmiri people called for an all out war against Indian imperialism and established a National Government of the people of Jammu and Kashmir. In a spillover effect, Azad Kashmir became increasingly restive. The Indian army made a series of new moves across the ceasefire line with her regular armed forces. 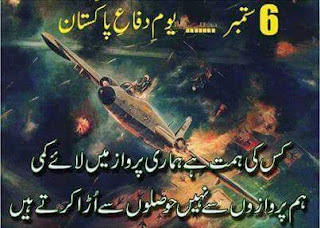 At 3:00 AM on September 6, 1965, without a formal declaration of war, Indians crossed the international border of West Pakistan and launched a three-pronged offensive against Lahore, Sialkot and Rajasthan. There was a fierce tank battle on the plains of Punjab. The domestic Indo-Pak conflict transformed into an international conflict and raised Super Power concerns. The U. S. suspended military supplies to both sides during the Indo-Pak War. Both the Soviet Union and the United States took a united stand to curtail the conflict within the boundaries of the Sub-continent from escalating into a global conflict. China threatened to intervene and offered military support to Pakistan. It was to keep China away from this conflict that both the Soviet Union and the United States pressured the U. N. to arrange for an immediate ceasefire. The main diplomatic effort to stop the fighting was conducted under the auspices of the United Nations and a ceasefire came into effect on September 23, 1965. 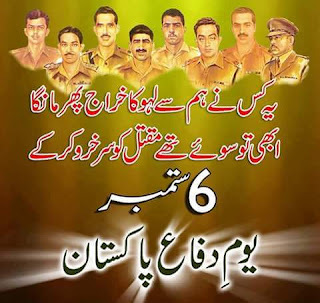 Nation will pay tribute to its Martyrs & their families on 6 September. Every Pakistani will be part of this unique campaign reaching out to their families, home, street, mohalla, village, city, province & place of Martyrdom. Lets salute their sacrifice.